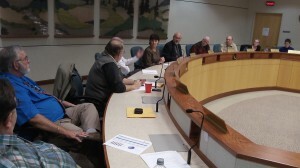 The Albany council at its meeting on Oct. 23. The last thing any Oregon town needs is a local prohibition against the kind of medical marijuana dispensaries that the legislature has passed a law to allow. The Albany council, as reported here Wednesday night, has voted to ask for a report on the options it has for keeping those dispensaries out. This after Councilor Bessie Johnson said she did not want them in Albany. It’s unclear whether cities have the authority to sidestep state law on this point. But the legislature passed this law for a good reason. Oregon voters authorized medical marijuana long ago, and the dispensary law is intended to minimize problems with what the voters set up. The problems are that legal users have to grow the stuff themselves or arrange for somebody to grow it for them. We’ve all read about the illicit trade that has developed. Big-time operators claimed to be growing a few plants each for their clients but in fact grew tons of the weed and sold it all over the country. Having legal dispensaries does away with this illicit business, or it should. Patients can buy what they need at licensed businesses operating above board in a regulated way. From Councilman Floyd Collins: The vote was to have research (on) the subject and report to Council. We did not vote to disallow the use. At least two of the yes votes simply want factual information on the subject before we consider the subject. I, for one, do not know enough to make an informed decision at this time. From the conversation I am concerned about the apparent conflict between state and federal laws. Properly requesting information is not the same as favoring a specific action. Jim Engel: I don’t see a move to ban “alcohol dispensaries,” so could it be the taxes they generate are welcome and we tolerate the trade? At least a properly licensed and regulated marijuana dispensary would hopefully insure a quality product not contaminated by other drugs. Not to mention some tax money raised. Our police chief is correct that detecting a DUII from marijuana is more difficult than alcohol, but it is not impossible.